"This is the best thing to happen to our community since Timmies!" "Pure enjoyment! This initiative must continue!" More than 70 people from across the City took advantage of a test run route for a weekly shopping bus for Kawartha Lakes – nicknamed ‘White Lightning’ – last week. 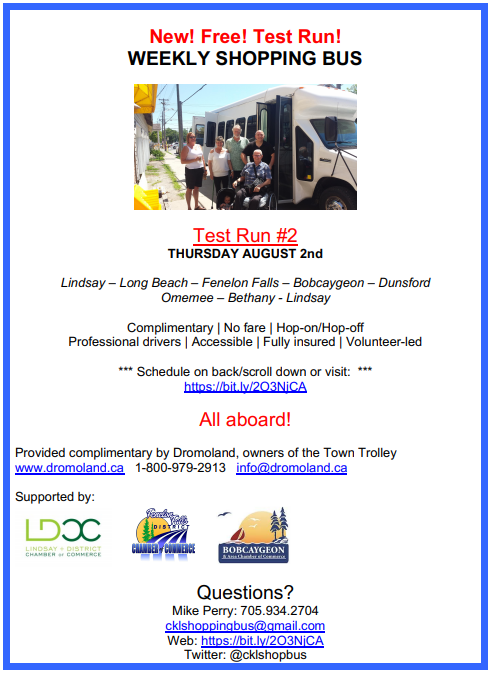 The test route ran on July 4th, doing three laps of the Little Britain-Lindsay-Cambray-Cameron-Fenelon Falls- Rosedale corridor, driving some 350 kilometres in more than 12 hours of service. The rural shopping bus is part of a three-point plan launched by local residents last December in order to increase transportation across this city. The shopping bus is being provided by a private sector owner who will look at maintaining and even expanding the service once the market research has been completed this fall. “As volunteers we’re just happy the schedule worked and the bus was on time”, joked Mike Perry, Co-Chair of the Kawartha Rural Transportation Working Group, who helped plan the test run. On a more serious note, he added: “Local residents just proved again the clear need and desire for transit outside of Lindsay. People were very happy with the service. Ridership was better than even we were expecting. We all know rural transit helps us all and is good for the local economy.” The second test route is being planned to cover the more eastern parts of the city. “This is simply excellent and I am so thankful for this,” proclaimed one rider in her comment form. “It’s the best thing to happen in our community since Timmies,” declared another. Riders used last week’s test run to shop locally, visit family, and even hit the beach with the kids in the hot weather. The tracking results showed that people from many communities and walks of life used the bus on its test run. The shuttle bus used professional drivers, is fully insured, and has complete accessibility. Complimentary music, water, and snacks were even provided on board. The Lindsay, Fenelon Falls, and Bobcaygeon Chambers of Commerce support the shopping bus as good for local businesses. The only complaint heard during the test run was that the service was not yet permanent. Riders were unanimous that such a bus is key. One rider noted he used the shuttle to get to Cameron to visit his family, which he has been unable to do for a long time without a car. Another rider, a single mother, was grateful for the bus as she was able to take her children to the beach in Fenelon Falls. People also shopped and dined at the locations along the test route. The plan is to keep the bus running this fall based on advertising, sponsorship and promotional opportunities. Local businesses are encouraged to get creative with such a hands-on, people-centred and much-needed fun, community concept. “This helps people while being a great business opportunity,” noted Michael Bryant, owner of the shopping bus, the town trolley and Dromoland Stables in Little Britain. “We are very encouraged by the results of the first test market”, he added. Perry noted that there is still work to be done listening to rider feedback, including more advertising and making the route schedule more user-friendly. The second test run will be scheduled and publicized in the next few weeks.